This research examines the evidence for prehistoric ceramic exchange networks over the last 2000 years in northwest Alaska through the use of neutron activation analysis of ceramic artifacts. Results from ceramic analysis on eight coastal and inland archaeological sites identified three source macrogroups and three associated subgroups. Clay source diversity and shared source macrogroups between geographically distant sites suggest the use of multiple sources and/or the movement of pots between production locales, mirroring related patterns in pottery stylistic data. 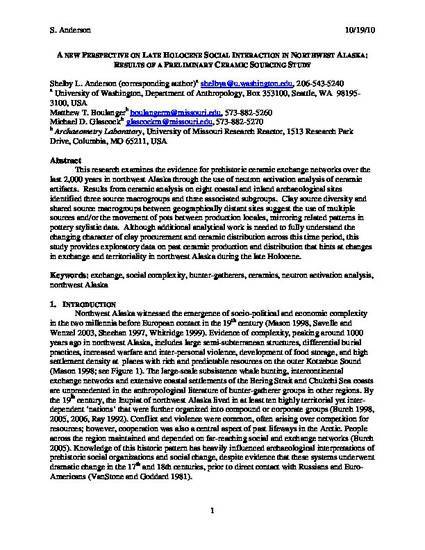 Although additional analytical work is needed to fully understand the changing character of clay procurement and ceramic distribution across this time period, this study provides exploratory data on past ceramic production and distribution that hints at changes in exchange and territoriality in northwest Alaska during the late Holocene. NOTICE: this is the author’s version of a work that was accepted for publication in Journal of Archaeological Science. Changes resulting from the publishing process, such as peer review, editing, corrections, structural formatting, and other quality control mechanisms may not be reflected in this document. Changes may have been made to this work since it was submitted for publication. A definitive version was subsequently published in Journal of Archaeological Science, Vol. 38 Issue 5, 2011.